Love the seafront living in the east but can’t find the perfect new development that is both freehold and have ample of facilities? The upcoming iconic Amber Park by Cityzens Development Pte Ltd (CDL) and Hong Realty Private Limited might be the right home for you. Sitting on a huge land with a site area of 213,676 square feet, Amber Park will be one of the most iconic mega residential development in the highly desirable Amber Estate of the District 15. Despite the large land size, there will only be 592 exclusive condominium apartments in the development. The condominium will comprise of three 21-storey high residential towers and these towers are connected by The Stratosphere, a recreational sky garden located at the rooftop of the development. Boasting a height of 235 feet above the sea of East Coast Park, the Stratosphere will be a signature feature of the development and offers its residents a dazzling view of the sea. 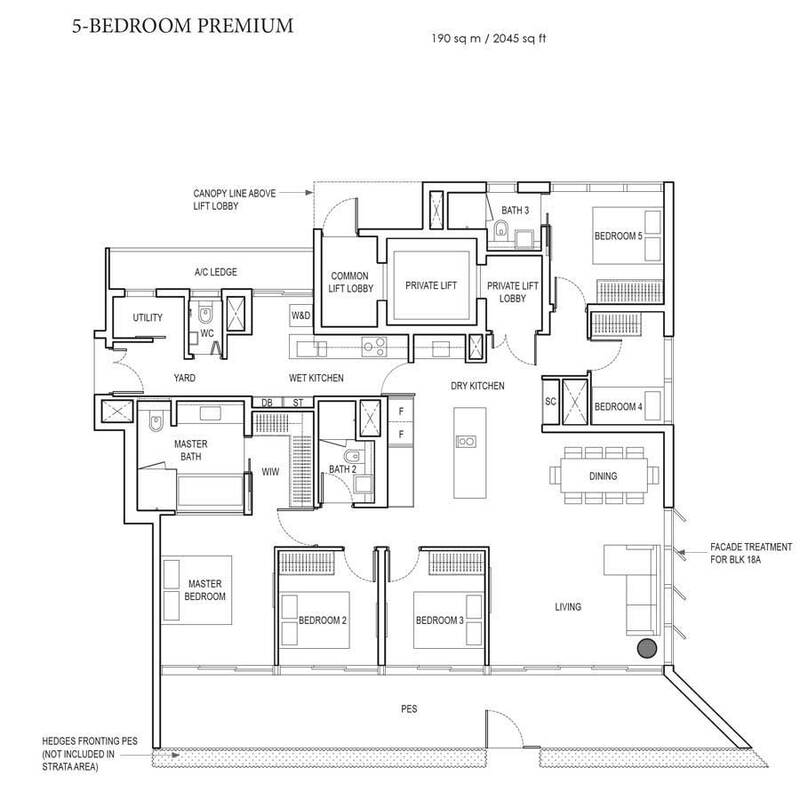 A wide selection of units ranging from 1-Bedroom suite that comes with a study room to 5-Bedroom plus study suite are found within the development. Most of the apartments are designed in a north-south orientation and residents will get to enjoy breathtaking views of either the sea, city’s skyline or pool views. Top notched materials are used to ensure all units are well furnished with fittings of excellent qualities. The living area and bedrooms floorings are meticulously designed with fine marble flooring and engineered Timber respectively. The kitchens are fully fitted with compressed quartz countertop and built in appliances. Private life access are provided for the bigger units such as the 4 and 5 Bedroom Premium, 5-Bedroom with Study and the penthouses. A Personal Residential Service Counter catered to the residents of Amber Park are also available at the Welcome Lobby. A large Lagoon Pool, Hydrotherapy Pool, Garden and Private Dining corners can be found at the entertainment deck on level 1. Other than the wide spread of facilities that span across the Lagoon Bay, recreational facilities such as a 600m long jogging track, a Gymnasium, a Yoga Deck, etc are also available at The Stratosphere. Amber Park is approximately 200m walk to the future Tanjong Katong MRT station. The Tanjong Katong MRT station which will be completed in 2023 forms part of the Thomson-East Coast Line and is linked to the Shenton business hub, Marina financial district and Orchard shopping belt directly. Situated next to the East Coast Beach, it takes a rough 10 minutes’ walk for one to reach this top-rate Singapore’s hotspot. The gorgeous East Coast Beach is definitely one of the favorite attractions among the locals as it is a great hangout place for friends and families. How convenient it is that the residents of Amber Park can just pop over anytime of the week for a relaxed cycling tour or nice picnic next to the beach. The Katong Shopping Centre and I12 Shopping Mall are both in close proximity. Retail, dining and entertainment amenities are just approximately 5 to 10 minutes by foot. A short drive away, there are the Parkway Parade, Kinex Shopping centre. Alternatively, the East Coast Park is also another area that is famous for its heritage eats and chic bistros. Within 1 Km away, there is the Tanjong Katong Primary School. Other nearby schools include Tao Nan primary School, Haig Girls’ School, Victoria School and CHIJ (Katong) Primary School. Amber Park is seamlessly linked to all parts of Singapore via 3 expressways, they are Marina Coastal Expressway (MCE), Pan Island Expressway (PIE) and East Coast Parkway (ECP). It takes only a short drive for residents to reach the Central Business District (CBD) and the Singapore Sports Hub.